The study of cells had its birth with the invention of the microscope in the 17th century. In the years that followed, this new technology was improved upon, and scientists became increasingly familiar with the microscopic features of cells. In the late 1830s two German biologists, the botanist Schleiden and the zoologist Schwann, independently observed that all the organisms they were studying were composed of cells. This realization is now generalized in a simple principle: “the cell is the building block of organisms.” A few years later, Rudolph Virchow added that “cells come from pre-existing cells” based on his observations. These ideas comprise what is now known as the Cell Theory. As the scientific study of cells progressed, scientists developed a classification system for cells based on their complexity. Prokaryotic cells, like bacteria, are quite simple because they do not have any membranous organelles such as a nucleus, mitochondria, or chloroplasts. Animal, plant and fungus cells are eukaryotic and contain organelles with membranes. Each organelle has its own characteristic structure, function, and contribution to the overall function of the cell. The biggest advantage eukaryotic cells have over prokaryotic ones is compartmentalization. With an assortment of membrane-bound spaces (organelles), countless different reactions and processes can co-exist in eukaryotic cells without interfering with one another. Thus eukaryotic cells are more efficient, diversified, and specialized. The Cell Structures study guide unit considers the structure and function of many of the organelles that contribute to compartmentalization. 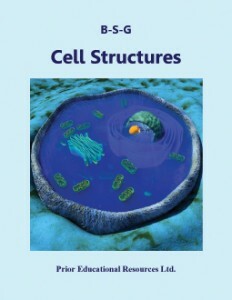 Cell Structures is excerpted from our Biology 12 Study Guide, which is the sixth edition of a student study guide written to match the curriculum of British Columbia. The concepts presented are applicable to the biology curricula of other educational jurisdictions as well.